FE Warren AFB is one of three missile bases in the US and is located in Cheyenne, Wyoming. It is the oldest continuously active military installation within the Air Force and the first Intercontinental Ballistic Missile base. 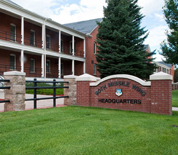 The host wing on base is the 90th Missile Wing assigned to the Twentieth Air Force Air Global Strike Command. They operate the LGM-30G Minuteman III. The headquarters of the Twentieth Air Force is also located at Warren AFB. The Annual Frontier Days Celebration in Cheyenne is a popular event for those who call FE Warren home. This FE Warren AFB directory features the critical info you’ll need to navigate through the many facilities and recreational opportunities available on base.